The AT8022 is a stereo electret condenser designed for field use: portable recorders, video cameras, etc. It can be powered by phantom power (11-52V) or a single AA (UM3) battery. The mic has two electret condenser capsules mounted in near-coincident fashion. 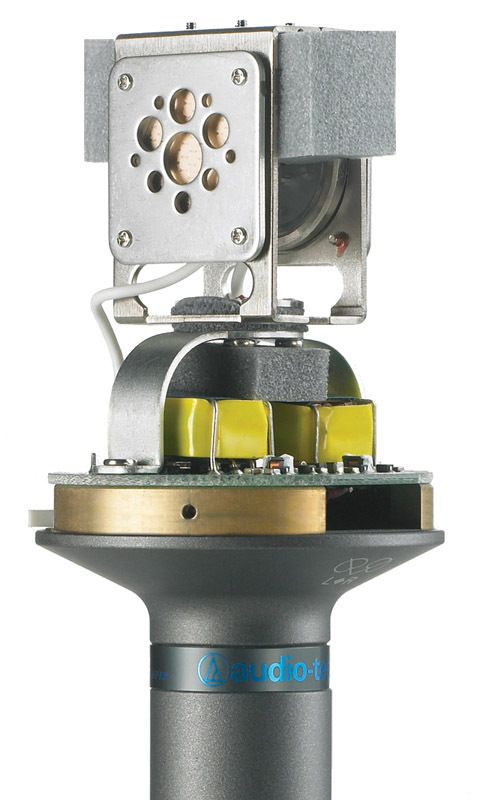 Oddly for an XY-stereo mic, the capsules are mounted back-to-back — at 180°, rather than 90°. 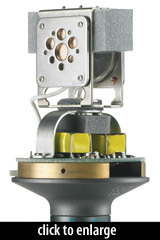 The mic achieves an XY pickup pattern via “damping and porting,” according to ATUS Audio Solutions. The perforated baffle plate mounted in front of the capsule is part of this design. The capsules themselves are modified versions of the AT4021 capsule. The diaphragms are made of 2-micron PPS (Polyphenylene Sulfide), a plastic resin known for its thermal and directional stability. Diaphragm diameter is 16.3mm; the capsule diameter is 21mm. Note that the mic is designed for end-address use, and can be mounted atop a video camera. It is due to the damping and porting of the capsules that the mic can create an XY-stereo image from sounds that happen primarily off-axis. The mic also includes a mic clip (p/n AT8405a), foam windscreen, battery, and a storage pouch. In August, 2009, Audio-Technica issued a Service Bulletin offering a free repair for all AT8022 with date codes 0840, 0843, 0848, 0904, 0909, 0921. The mics are wired out of phase, making the difficult to use in conjunction with in-phase microphones. See sidebar link for contact info. The Audio-Technica AT8022 is also known as: AT-8022.